A boy goes Perth story! Finds good Perth food. Essentially, a Perth Food Blog. - no longer active! Siem Reap: A fine journey of temples and food. 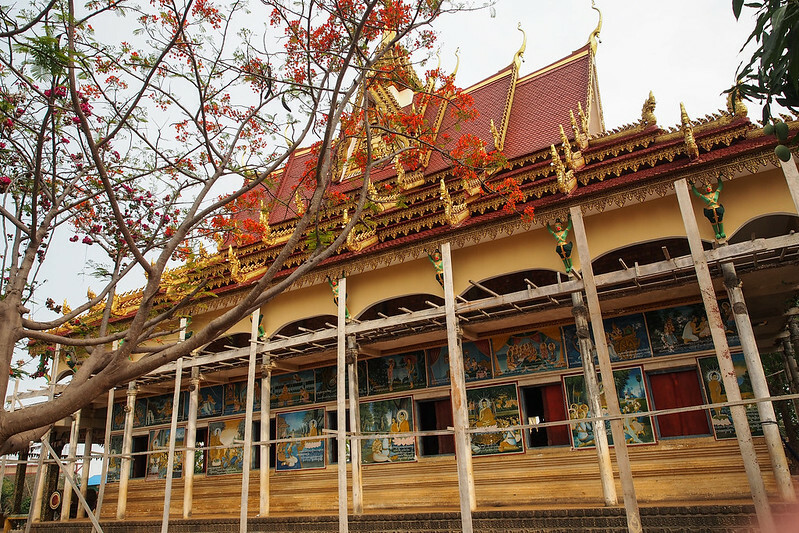 Siem Reap is a little city North of Cambodia that relies very heavily on tourism. Well-known for its magnificent Angkor Temples and night life at Pub Street, I found that Siem Reap had a lot more to offer than just that especially for foodies like me.The Khmer cuisine by itself is a little lacklustre due to the moderate use of spices and seasoning. Being sandwiched by Thailand and Vietnam, i.e two of the greatest countries for foodies does not help either. But look a little deeper and you will realise that there are several places in town that pay a little more attention detail and infuses techniques not known to traditional Khmer cooks to create a sensory pleasing journey. Asia’s 50th best restaurant is helmed by Joannes Riviere who seeks to re-creates the Khmer cuisine with a touch of French. The flavours throughout the meal were very crisp. The finish was clean and there were not lingering/overpowering flavours from the usual suspects of fine dining. Mie Cafe was on my itinerary as an option, and not an essential until I dined at the restaurant. From the zesty salad course to the skimpy dish of grilled prawn with butter and the rich chocolate fondant at the end, it was just heaven on earth for Mie. Course 1; Carpaccio of snake head fish with Cambodian spices, grapefruit and hazelnut oil dressing served with poached egg tempura at Mie Cafe. They say first impressions are the most lasting. A social enterprise aimed at helping the vulnerable by teaching them an important life skill. As Haven's tagline suggests, “where helping taste good”. That is because for most parts of the meal, it really was! The menu looked suspiciously Thai but the food from these two regions are fairly intertwined making it hard to tell them apart without tasting. While I could not find the Khmer inspiration in the dishes here, it was safe to say that Touich Restaurant Bar presented to me some very well-executed dishes that regarded the Thai cuisine in the most respectable manner. That is, by presenting it with quality and authenticity. After having several French inspired Khmer dining, I decided to sample the local palate of traditional Khmer cuisine. My meal at Khmer Kitchen (un-blogged) in the heart of Siem Reap was pretty decent, with a subtler, more balanced flavour that tended to be a little less exciting than its South East Asian counter part Thailand. But what happens when you bring the cuisine one notch up? Touich Restaurant Bar served my last dinner in Cambodia. The menu looked suspiciously Thai but the food from these two regions are fairly intertwined its hard to tell them apart without tasting. Eventually, we succumbed to the Thai cuisines on offer along with a lovely dish from the grill. To start was a Tom Yam Soup and Mango Salad. The Mango salad was absolutely sensational! Sweet, sour and salty came together with the crunchy vegetables to whet the appetite. Several juicy shrimps added short notes of seafood flavour but it was hardly as impactful as the mint and basil in the salad. The zesty flavour the the lime was hard to dislike too. Very good. The Tom Yam was supposed to be a main but we called it as an appetiser anyway! 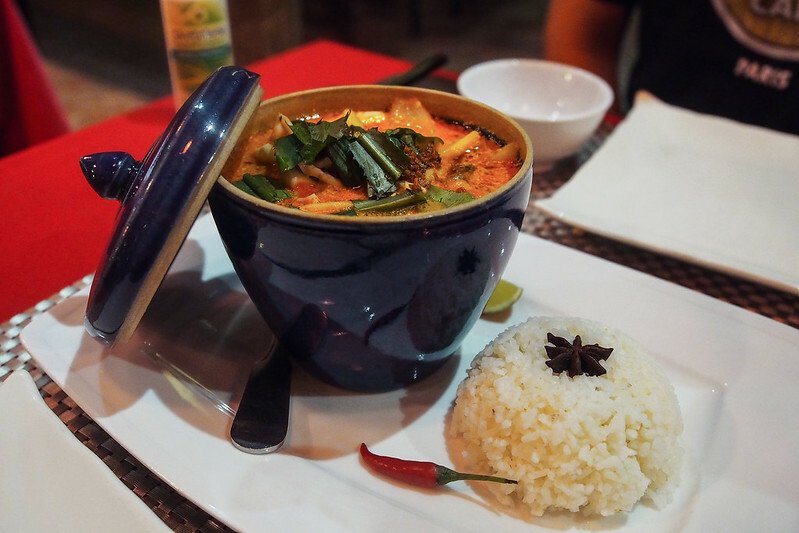 I have to say, whilst this was not the best Tom Yam I have ever had, this little pot was laden with ingredients. From Galangal to Coriander to lemon grass, onion and the list goes on. It is as if the chef decided to pull every herb in her cook book and give it a go. To finish were some very coarsely cut up squid and prawns for protein. The product was very close to being sensational but perhaps the heat could be turned up! For the best Tom Yam, nothing beats the one I had at Chatuchak Market in Thailand. JH’s dish after due diligence was the Stir Fried Scallops and Prawns $10.50 USD. It was Trip Advisor’s recommendation. There were heaps of scallops in this dish but with most of them being very small in size, there was hardly any excitement. It was after all the very similar to the Basil stir fry which we had at Haven Training Kitchen called the Lok Lak and something we ordered the night before too. I think the both of us definitely could not recommend this dish to anyone. 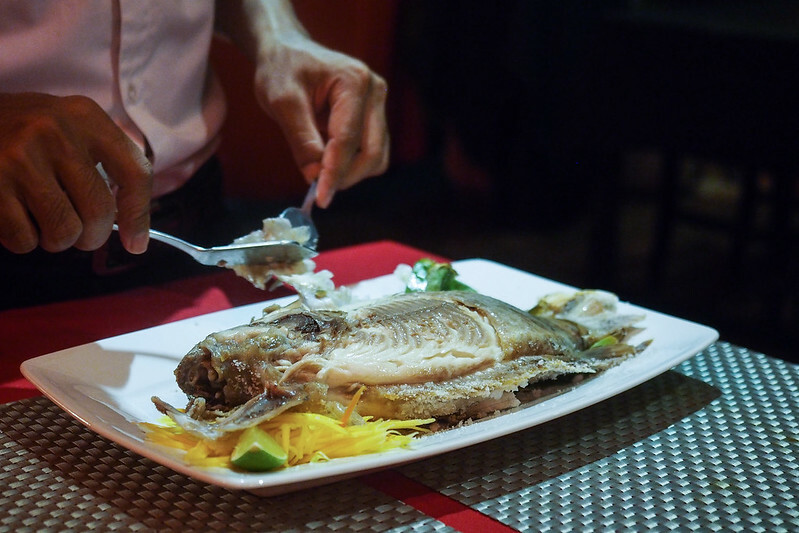 The last dish for the night was the Salt Baked Snapper $11.50 USD. When the fish came out coated in a crusty layer of salt, I was sold. Strangely enough reminded me of the Bangkok with the boys last year! Smashing fun. The waiter offered to peel the skin off which we gladly accepted. As the skin pilled off part by part, the moist flesh was revealed. This was the beauty of the salt baked fish. Juicy on the inside, but flavoured so very tenderly by the salt on the outside. And the real killer lies in the sauce served on the size. A zesty, garlicky sauce with a punch of sugar and a dash of acidity from the lime. Sensational all together! 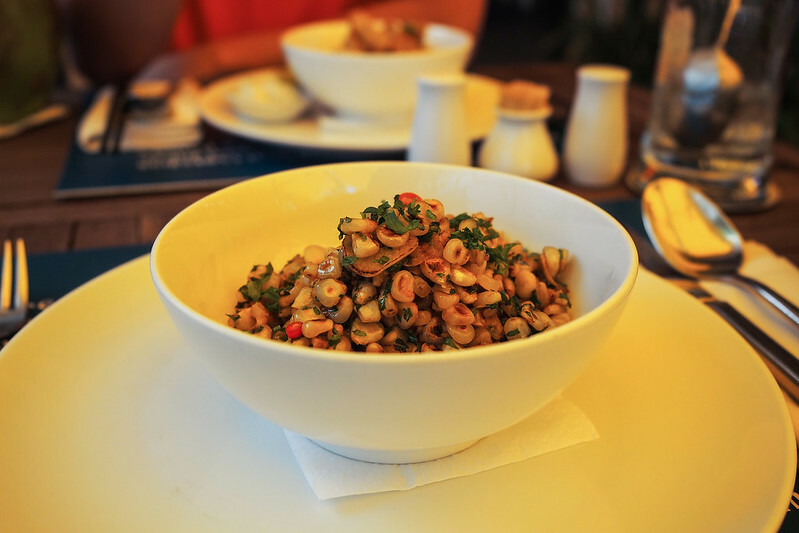 The meal at Touich Restaurant Bar was every bit satisfying. It was a little over $30 USD for the two of us and we were filled to the brim! So full it was hard getting back to the hotel. While I could not find the Khmer inspiration in the dishes, it was safe to say that Touich Restaurant Bar in Siem Reap presented to me some very well-executed dishes that regarded the Thai cuisine in the most respectable manner. That is, by presenting it with quality and authenticity. Was it a weird choice of restaurant to be dining at considering I was in Cambodia? Well, maybe yes, but any regrets? Definitely NO. Do note that the seating is outdoor only. In hotter and wetter seasons, mosquitoes are quite apparent so the restaurant offers free repellants. Siem Reap: Haven Training Restaurant, where helping taste good. 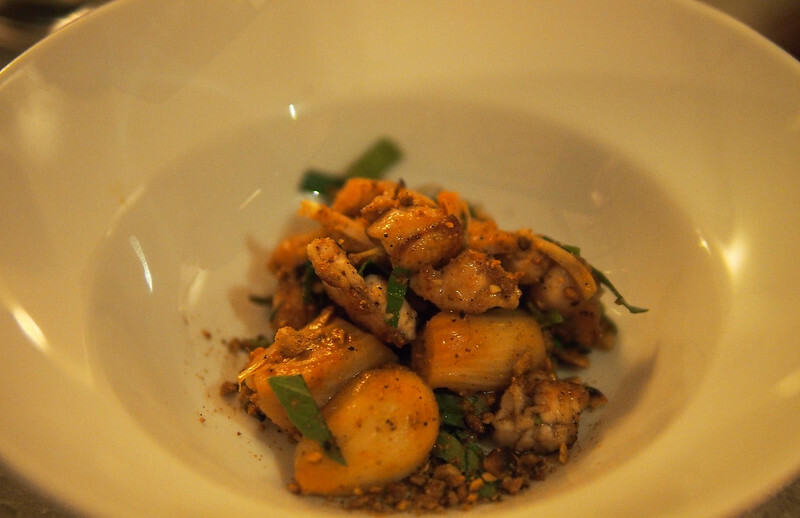 Fine dining in Siem Reap was a pleasant experience with local ingredients working their way to excite my palate. But on my 3rd day, I wanted to fulfil a more noble cause by eating charitably. I dined at Haven Training Restaurant, a social enterprise aimed at helping the vulnerable by teaching them an important life skill. Note that Haven is neither religious or governmental. 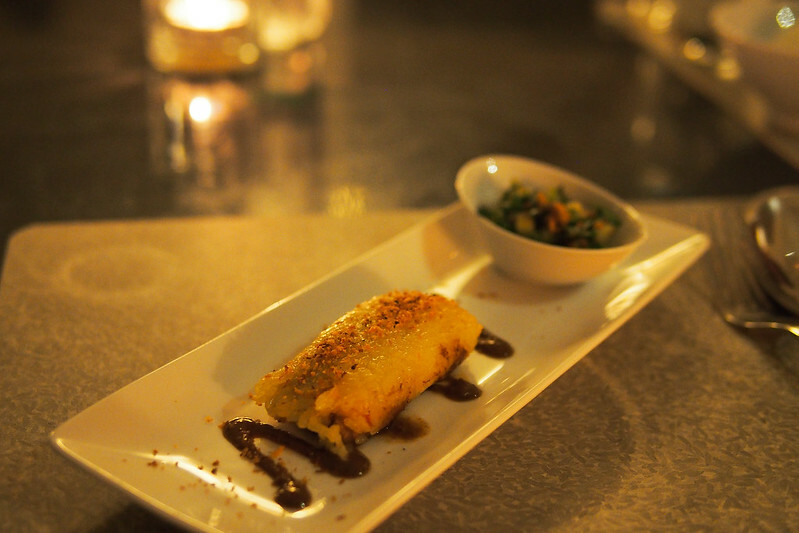 This humble dish needs no introduction. Haven aced it beyond the scoreboard in my opinion. Crisp, lightly battered and served crisp, these moreish bite sized appetiser was simply but every bit satisfying. The serve of tartare on the size was well-made with a balance struck between the tartness of the pickles and the creaminess of the mayonnaise. The fried corn is NOT a popcorn but rather a traditional Khmer appetiser . Scrapped of the corn cob, the kernels were fried upon order. It carried a unique flavour where it was a tad salty, garlicky, mildly spicy and herbed thanks to the generous amounts of chopped coriander. It was really nice at first but the large serve was hard to finish as the kernels felt a tad oily towards the end! Like the calamari, I suspect that the Cordon Bleu is another classic Western dish introduced by the owners. 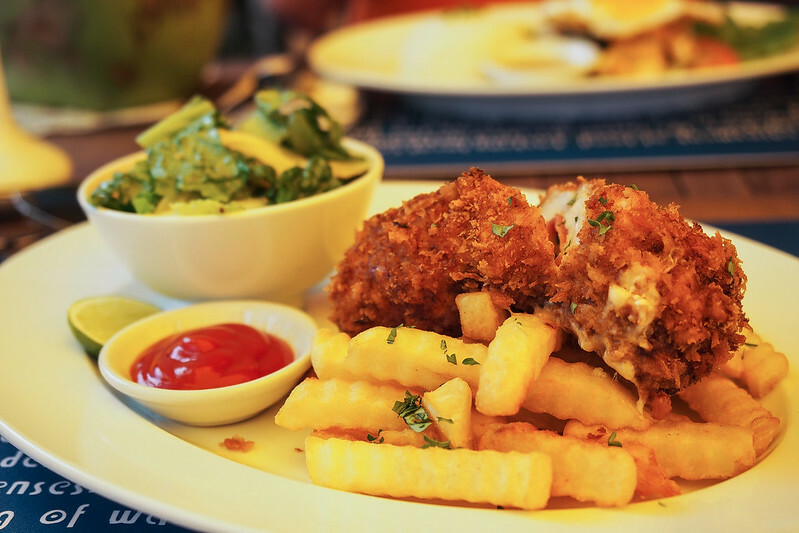 While the best Cordon Bleu probably hails from Switzerland, I was actually pretty impressed with the one served at Haven Training Restaurant. It was faultless to the extend that even the chicken breast was juicy! On the inside was a generous slice of ham and a decent kick of cheese! Not the cheesiest but it was substantial. If you are lazy like me and swap out the occasional Friday night chicken Parmi for a Cordon Bleu, you will be pretty impressed. The chips on the side, not impressive at all. Definitely needs to be crispier! 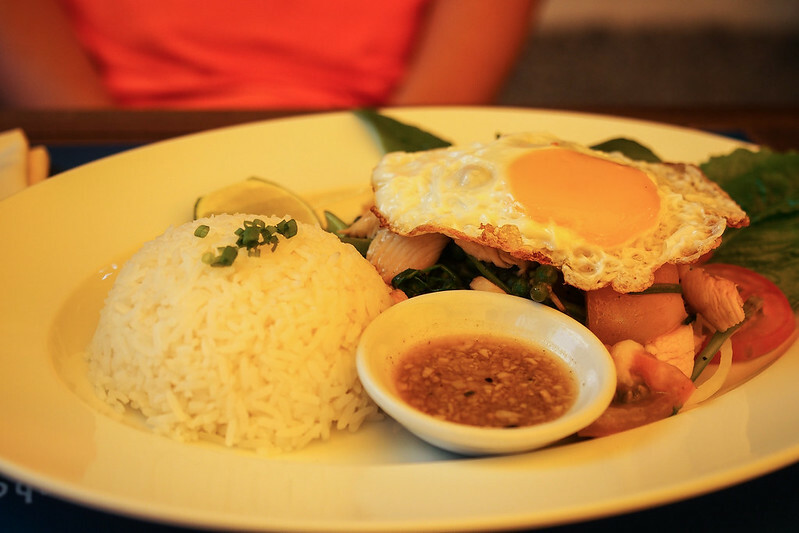 JH’s main was the Khmer Lok Lak after a practice of due diligence to ensure that only the best dishes were ordered. Surprise surprise. Another Pad Krapow look-alike. As I have preached several times in the last two posts, the Khmer palate is very SUBTLE. So do not expect heavy lashing of fish sauce, sweet soy and lemon. 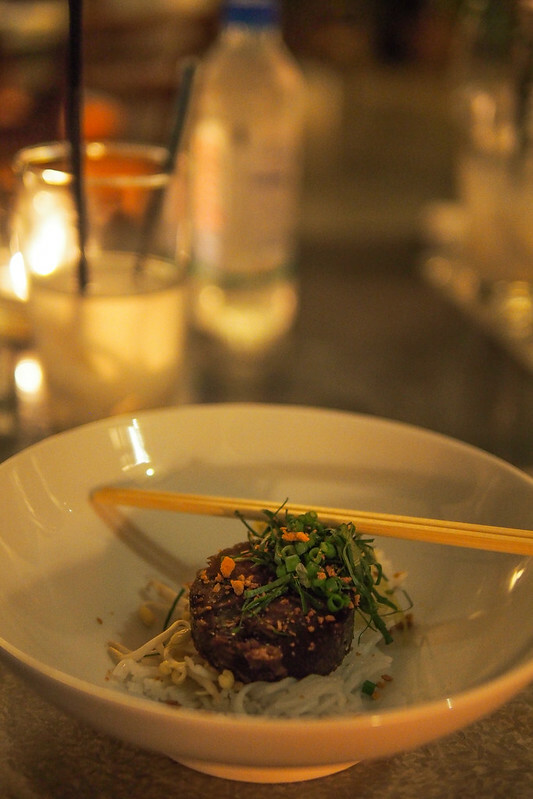 The Khmer Lok Lak was no exception. It was a little underwhelming but every bit delicious. Something mom would cook at home because an overdose in seasoning is unhealthy! A surprising appetiser that was quite nice actually. 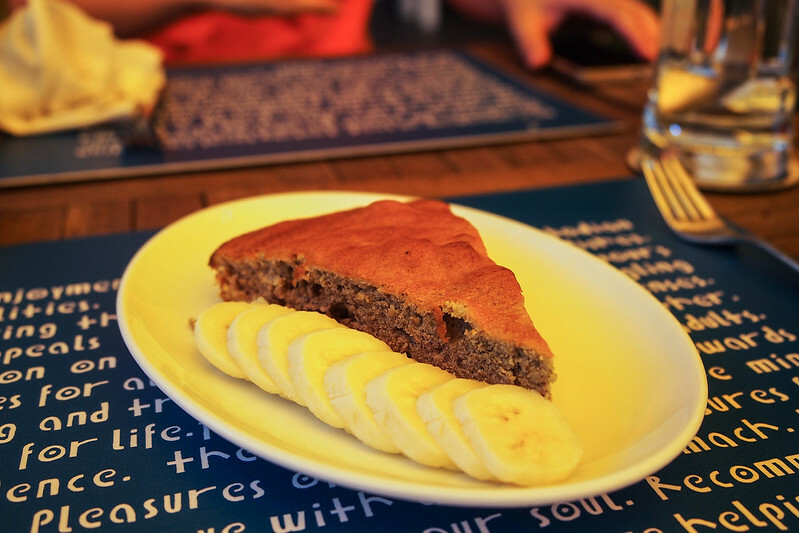 A littler drier and denser than a typical banana cake but it was flavoursome enough to tempt. I imagine having it with coconut ice cream would make it even better :P! Charity is a very sellable idea in this modern day and if you are not convinced, come in without a booking at dinner and be turned away in an instant. Lunch on the other hand is not so stringent. And do not get me wrong, I am not belittling the idea of charity and honestly I loved the idea of helping. As Haven's tagline suggests, “where helping taste good”. That is because for most parts of the meal, it really did! But was this meal really a $30 dollar meal including 2 coconuts? Hmm I wonder. Haven training kitchen is ranked no.3 on Trip Advisor and despite open voting, I am not sure whether the voters were voting by their mouths or by their intentions. Needless to say if a person ever asked me whether I would return to Haven? More yes than no for sure. Siem Reap: A quality lunch at Mie Cafe! The 5 AM Angkor sunrise tour in Siem Reap is a real tourist cliche. But with nothing else planned and the promise of a spectacular view, I decided to trade good breakfast and some much needed sleep for a temple tour. Something laughable. The private driver costs $35 for the day and the temple 1 day pass is $20 per person. Highly recommended for parties wanting a quick tour as group tours are very draggy! 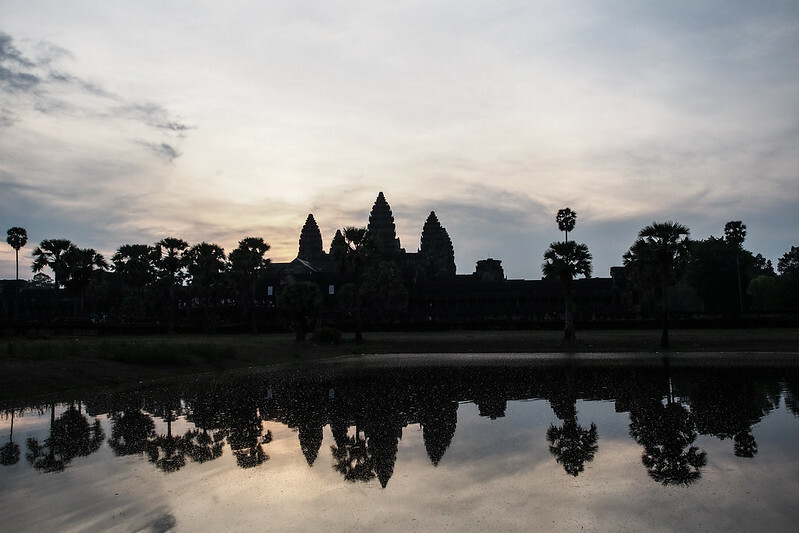 Cruising through the spectacular sights of Angkor Wat, the Bayon Temple and Angkor Thom showed me how these ancient superstructures heralded a preservation initiative by the Khmer government. But scenic views does not keep a hungry stomach filled. Not to mention the pack breakfast of cold bread reminded me of why I eat oatmeal instead. After the temple tour, the private guide will always try to bring you to a restaurant which covers his meal and gives him commission. Fortunately, I found a place before coming and booked a table. It was Mie Cafe which is located half-way between the temple roads and the city centre. Just perfect as we were on our way home! 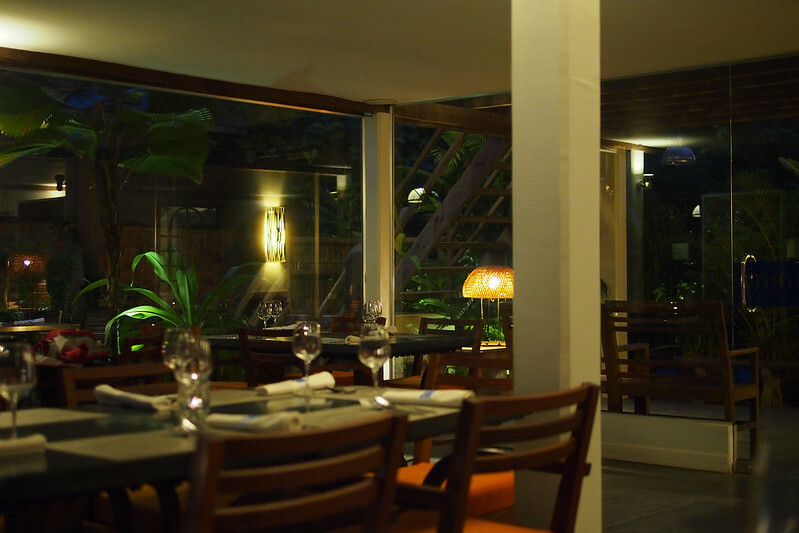 Mie Cafe is one of the many French restaurants with a Khmer inspired menu is Khmer graced with a touch of French. As always, local produce gets first priority. The tasting menu is $24 per person plus 7% tax. 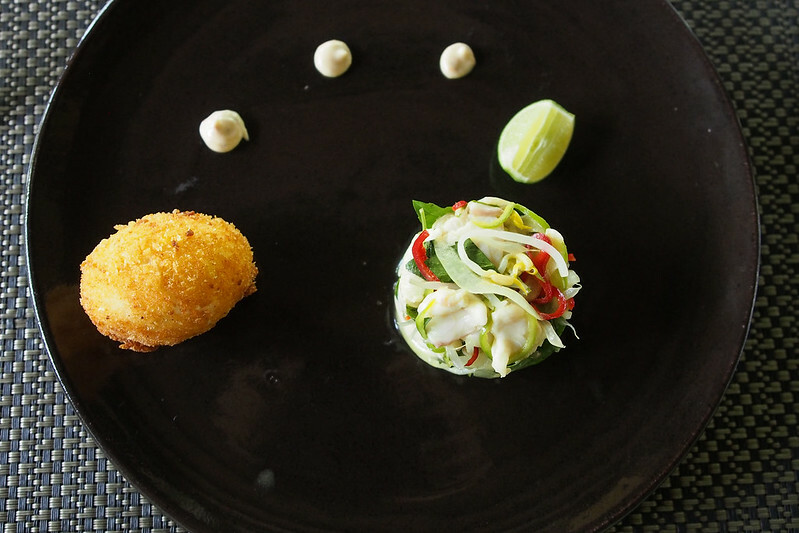 To start was the Carpaccio of fresh snake head fish fillet cooked in fresh citrus juice with Cambodian spices, grapefruit and hazelnut oil dressing served with poached egg tempura. This was a lovely salad! Firstly, the ceviche was well-coated in a zesty citrus dressing. Each mouthful of the salad was a bliss, thanks to the generous amount of mint, basil and chillies that made it extremely aromatic. The oozy yolk from the tempura as well as the dollops of homemade mayonnaise brought the dish together very very nicely. 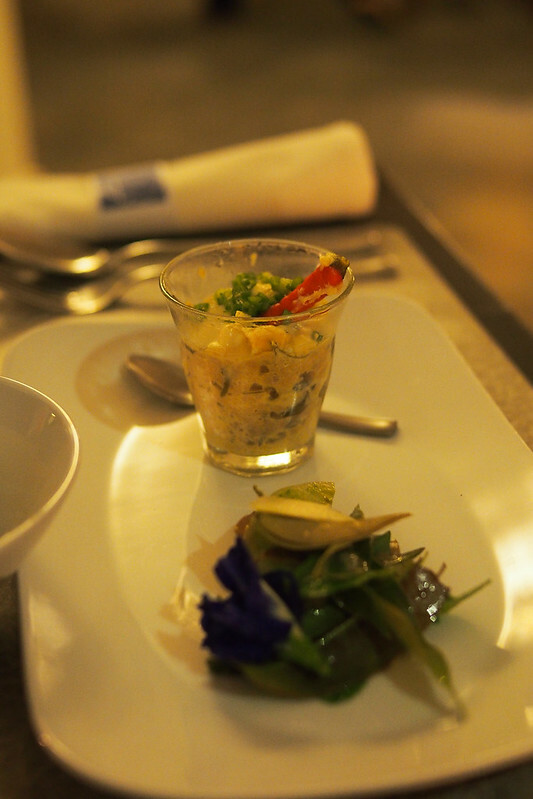 (Samlor Pror herh) Crab meat emulsion with green peas, porhok fish and vegetable consommé, wild herb. The purpose of this course was clear. 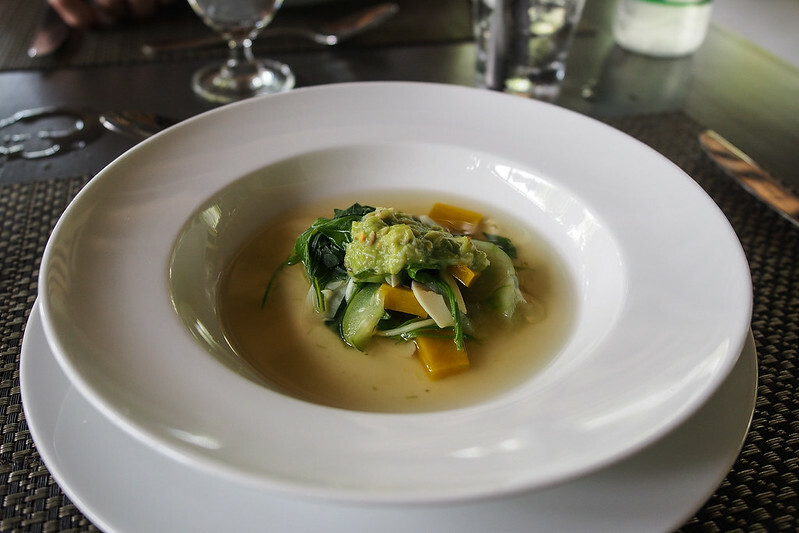 The consommé surrounding the barely marinated ingredients intended to rid the palate off the flavours from the rich starter earlier. This course was hardly impressive but it served its purpose. It left a clean aftertaste almost as though one had drank a glass of chilled unsweetened tea. Neat. 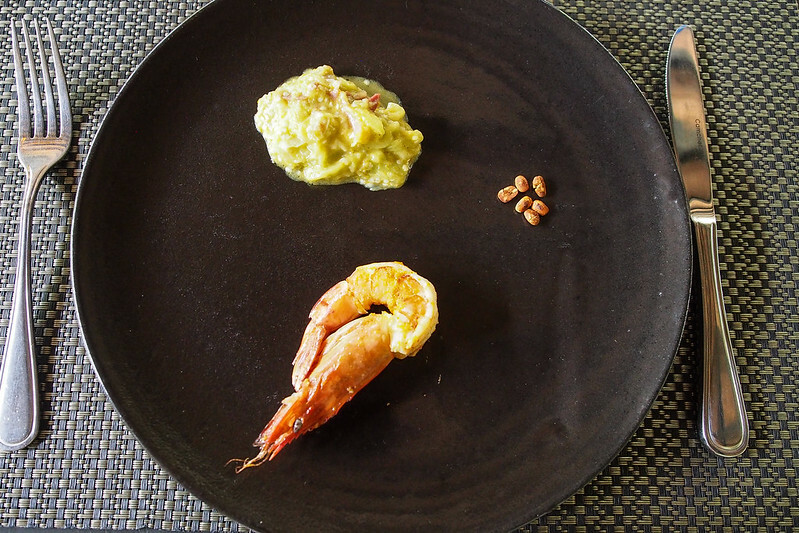 Grilled prawn with Amok butter, roasted somanea seed, eggplant with coconut milk and dry cure ham. When my 3rd course arrived at the table, I was shocked by the quantity on the plate. But hey, its about the quality and not quantity right? haha. 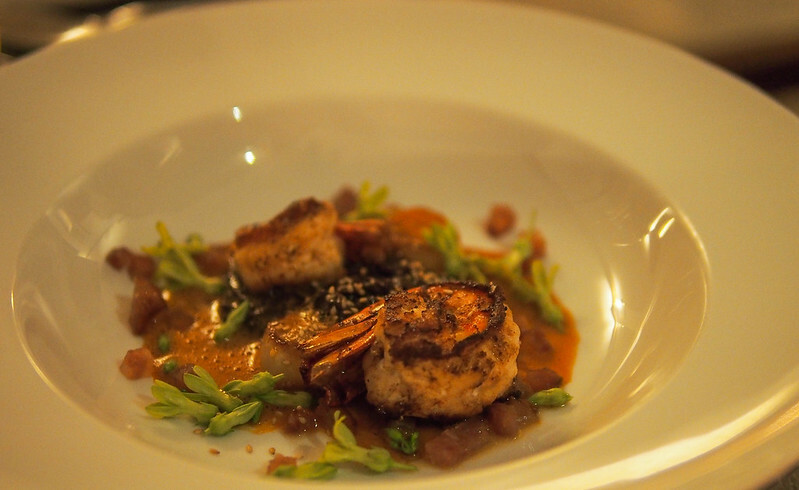 If you manage to get past that stage, you will appreciate how the prawn was cooked to perfection. The buttery smell made me crave for more instantly! Pair the prawn with the eggplant stewed with the cured ham and you are certain to get a curry like flavour. This dish was small but absolutely deadly. This was the last savoury course and it looked typically Chinese. But the immense refinement in cooking technique resulted in an unparalled eggplant dish. Moist flavoursome mince and melt in your mouth aubergine was all the hype here. There was some chilli in this dish but extremely mild. Served with a bowl of rice, this was a dish to remember. It was really delicious! 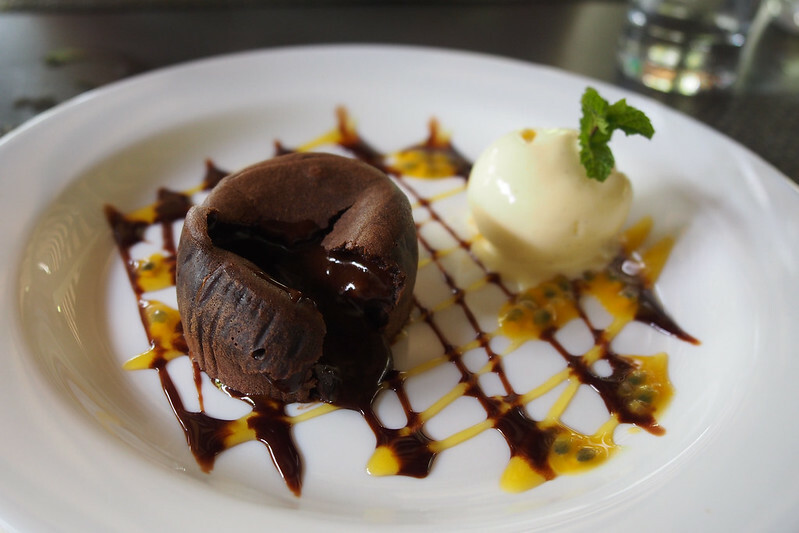 Fresh out of the oven, I was not convinced by the sloppy presentation consisting of passionfruit and chocolate sauce. But then, I cut the fondant into half. And nothing else in the world mattered anymore. It was simply delicious. Rich, dark and well-toned sweetness. This fondant was just spot on. The fruit and mildly acidic passion fruit help add dimension to the dessert and the whole thing just really worked. If you ever get burnt by the super hot fondant, the ice cream helps :)! Mie Cafe was on my itinerary as an option, and not an essential. But after an afternoon dining on meals where everything was so good, I think future itineraries will have to be changed. The food at Mie Cafe went well beyond our expectations. 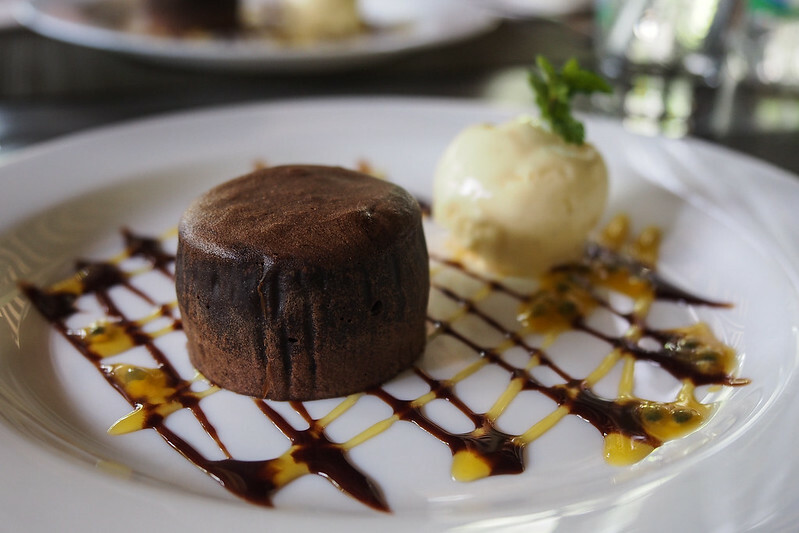 From the zesty salad course to the skimpy dish of grilled prawn with butter and the rich chocolate fondant, it was just heaven on earth. It was no wonder that the trainer at Haven Dining ranks Mie Cafe amongst his top dining destination. A restaurant worth re-visiting! 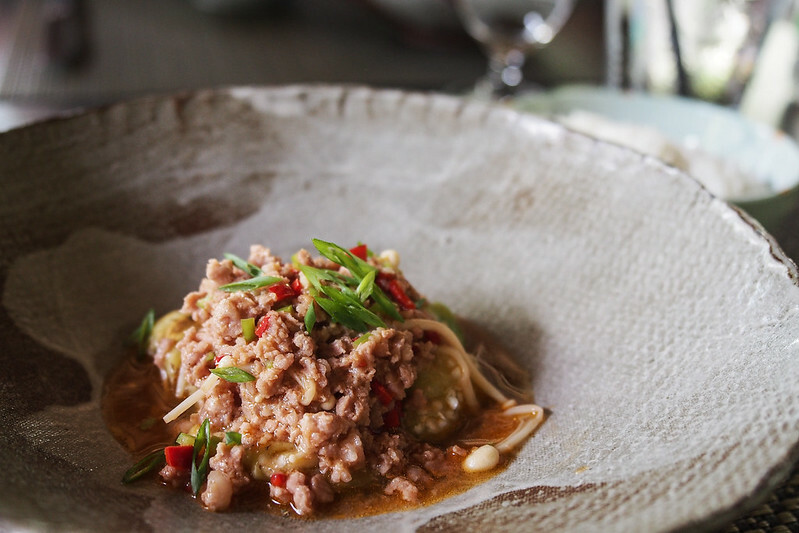 Siem Reap : Is Cuisine Wat Damnak one of Asia's 50 Best Restaurants? This year, St. Pellegrino recognised Cuisine Wat Damnak’s credentials by awarding it Asia’s 50th best restaurant. Coming to Siem Reap, I knew I simply had to go. Cuisine Wat Damnak is located just minutes from my hotel the Royal Crown Hotel in Siem Reap which means I could walk to this little super star. The 8 minute trek was short but not without its own excitement with the grounds unpaved and unchained stray dogs barking ferociously at us. Lightning and thunder in the background did not help either. But I guess its these little experiences that you bring home from holidays that spark good conversations. 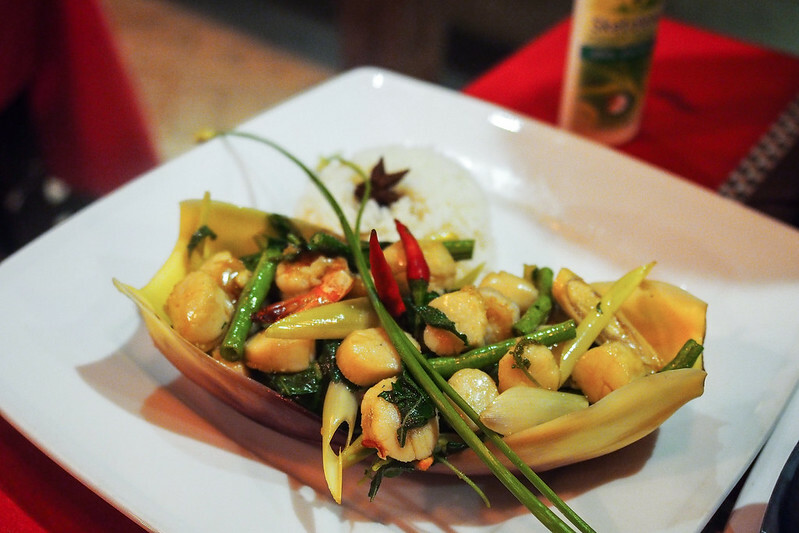 Cuisine Wat Damnak is helmed by Joannes Riviere and re-creates the usual Khmer cuisine using locally sourced produce. Every evening there are two menus; one of which incorporates a mixture of seafood and poultry or an all seafood affair. It costs $24 for 4 courses and $28 for 5 courses. JH and I each decided to each try one of their 6 course tasting menu. 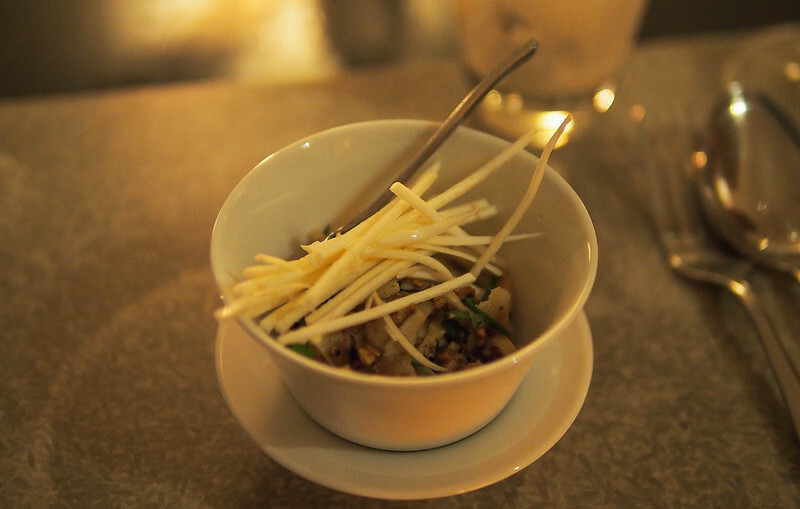 Amuse Bouche - Wat Damnak’s squid ceviche. 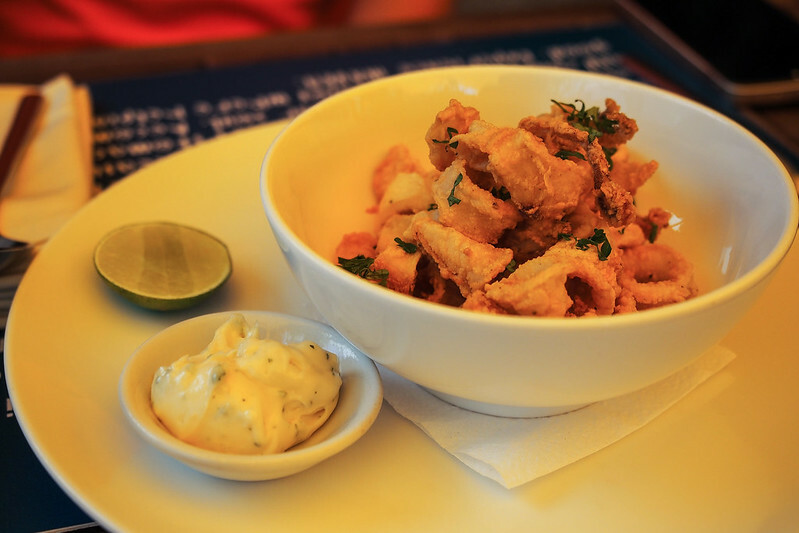 Tender squid, mildly acidic and slightly sweet. It was a pretty good start but I tend to like my ceviche a little colder compared to the conventional serving temperature (i.e room temperature) as the chill helps keep the dish refreshing. 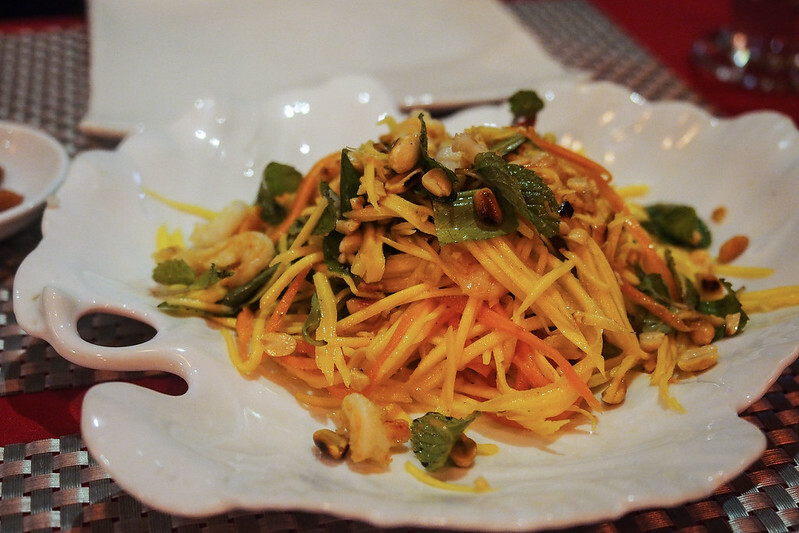 The flavours here are reminiscence of a Thai salad. The core flavours are very similar to the Amuse Bouche but a much sweetened beef rillette made it yums! A lovely stir-fry with tender frog flesh. Decent flavours but I could not really tell the jackfruit in the salad haha. I think it was a younger type. A unique dish that I truly enjoyed. Plump juicy prawns wrapped in glutinous rice and grilled over fire on a banana leaf. A mild fragrance swept across the plate as it arrived. I was sold. Sadly, the same cannot be said about the cucumber salad that was mildly bitter. I would have preferred perhaps another form of salad or none at all on the side. I liked this dish of JH’s but the presentation felt botchy and disconnected. Served with a side of rice, I could not mix the dish up seamlessly as it should be. Taste wise, it was creamy and all-round quite good. But it was not a stellar dish. Smoked fish were super crispy and pork ribs were cooked till fall-off-the-bone tender. Its soup base was potently salty which explains the presence of the rice to even the whole dish out. Great textures of crisp fish and tender pork ribs paired well with the slightly springy mushrooms and tender taro roots. The croaker fish soup is an instance where a simple fish is made outstanding. The broth was slightly underwhelming as the flavours were not quite as pronounced as the curry I had later that evening. It was OK over all. Loved the way the fish carried a mild body of smokiness with it. 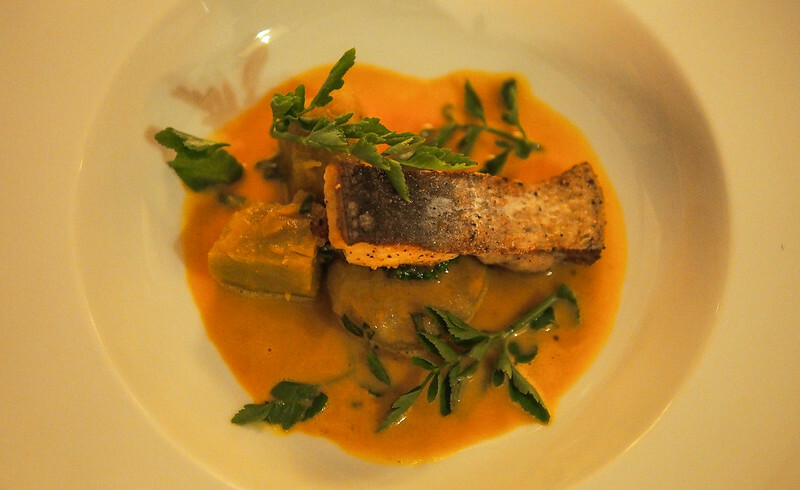 Menu 1, Course 4 - Sunday fish spicy curry with hot basil, pumpkin and dumpling. 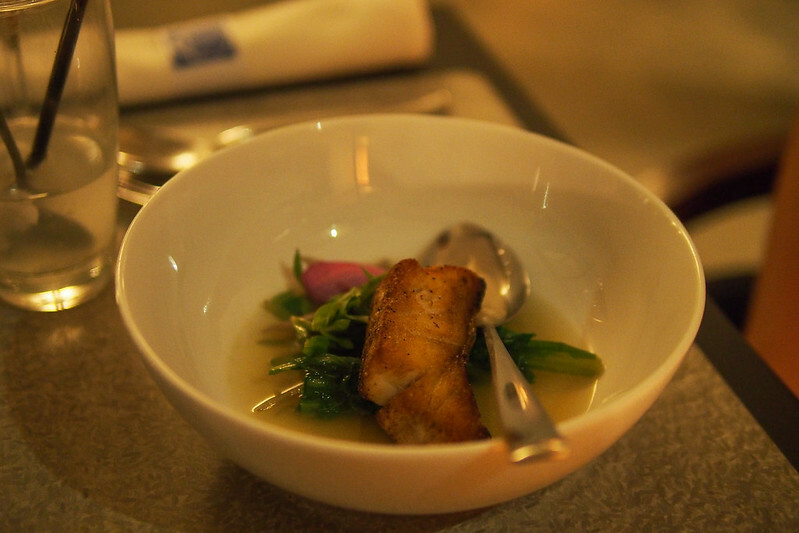 The perfection of the slowly grilled crispy skin fish wins me over anything else. 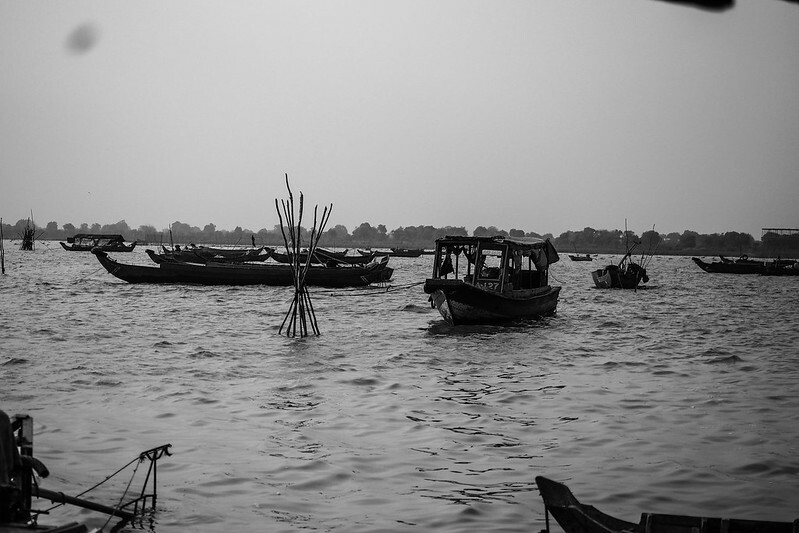 My expectation of river fish is fishy but Cuisine Wat Damnak proved me wrong. The fish was cooked so well it had mildly crisp skin with that whiff of smokiness just serenading my nostrils. Spicy curry fish sauce was creamy and pleasant but not at all spicy. Eat mouth were layers of flavours that were simply delicious. The langoustine looked gracious sitting on a bed of slow cooked black rice porridge graced by sprinkling of little edible flowers and diced sausages. The stock on which the langoustine’s sat on felt very French. I do not have the correct words for it unfortunately! It was an OK dish that lack a little flavour. The porridge felt like a pairing too starchy for the final savoury course. Even more so when rice was served at Courses 2 and 3. A little too much rice! This has got to be one of the best Panna Cotta I have ever had. It is simple but often made with imperfections. Cuisine Wat Damnak did well with a silky smooth custard. 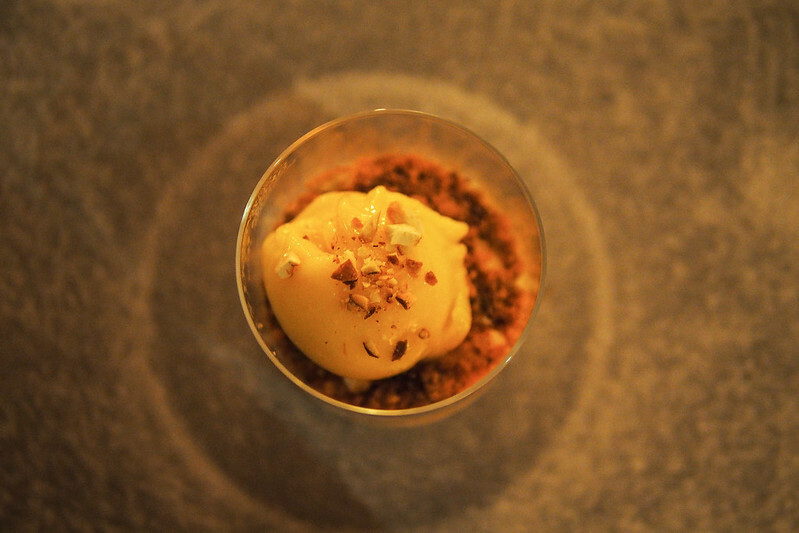 It brought it further by pairing the Panna Cotta with a cashew crumble which gave the dessert some nuttiness. To finish, the fruity note of mango throughout the dessert resulted in a decadent dessert that leaves the palate refreshed. I doubt anyone would have felt otherwise! Menu 2, Course 5 - Steamed dark chocolate cake, rice praline and Pandan whipped cream. 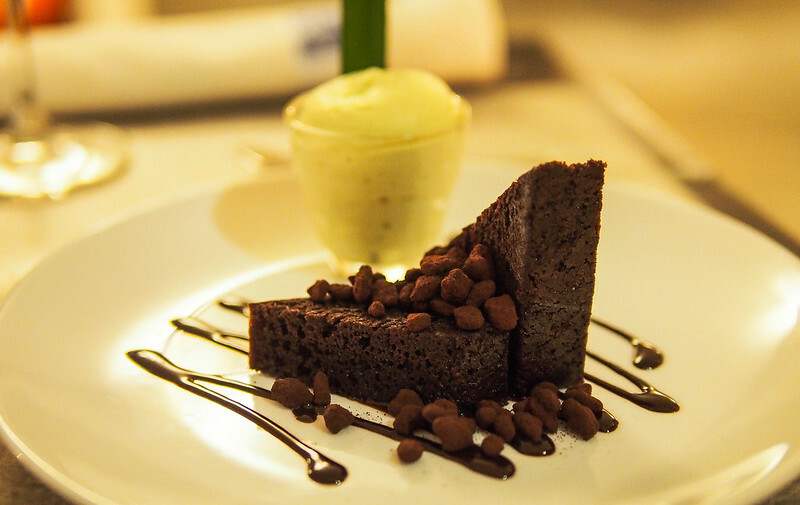 The French and their love of rich chocolate desserts has been very well-documented in cook books and shows. But I never knew that steamed cake could be so decadently chocolatey and moist at the same time . The cake here was soft and spongey with the little pieces of popped rice completing the dish with a crunch. I unfortunately did not take a liking towards the fragrant Pandan whipped cream. I wanted Pandan Ice Cream :)! It would have been much better. Just a personal preference though. Cuisine Wat Damnak has literally came from nowhere and made a name for itself on the food Atlas. From an even bigger picture perspective, it probably helped Siem Reap standout on the world map too. 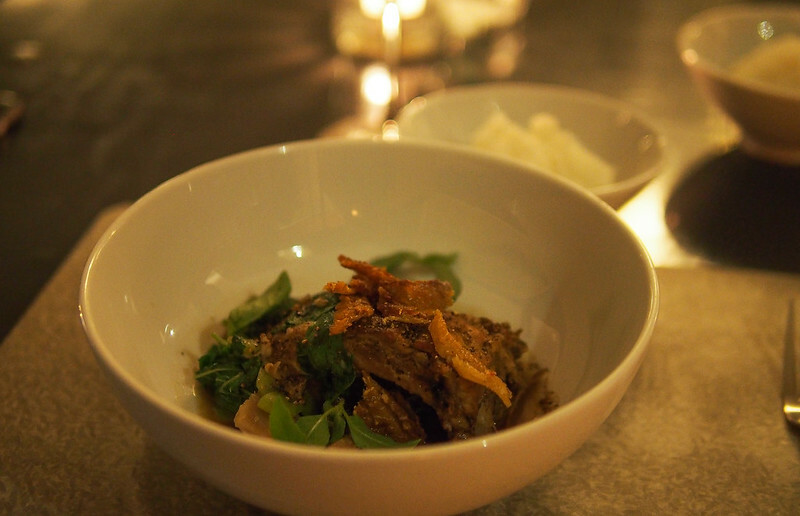 For a country that lives on a mere $1-2 a day, this $30 meal is by no means a cheap affair. But was it good? It definitely was. The flavours throughout the meal was very crisp. The finish was clean and there were not lingering/overpowering flavours from the usual suspects of fine dining such as foie gras, sea urchin, and other fatty meats. Progression was apparent as I went from start to end which is a nice thing to have. But to complement absolute perfection is a claim too farfetched. Execution at Cuisine Wat Damnak was a bit of a hit and a miss depending on which set menu you got. Whilst I was absolutely satisfied with the poultry and seafood set (Menu 1), the same cannot be said for JH who found the all-seafood menu (Menu 2) a little mundane. In saying that, it was not all doom and gloom but could definitely have been better. Do I think Cuisine Wat Damnak deserves a ranking in Asia? Definitely so! Room for improvements? Plenty. That is what rank 1-49 is for! Day Trip: A Foodie Tour to Malacca. Bites:Taro Taro @ Victoria Park. Not an End, but rather a New Beginning!